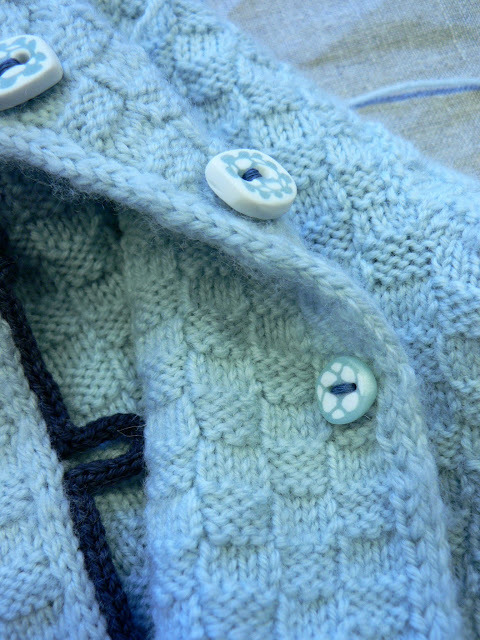 Do you still remember this wee cardigan I knitted a very long time ago. Finally the pattern is finished. And I still like it a lot. Returning to a pattern can be difficult, it can somehow grow old and does not bear the first love feeling any more, but then again, good elements can age beautifully and Aada has lots of them. 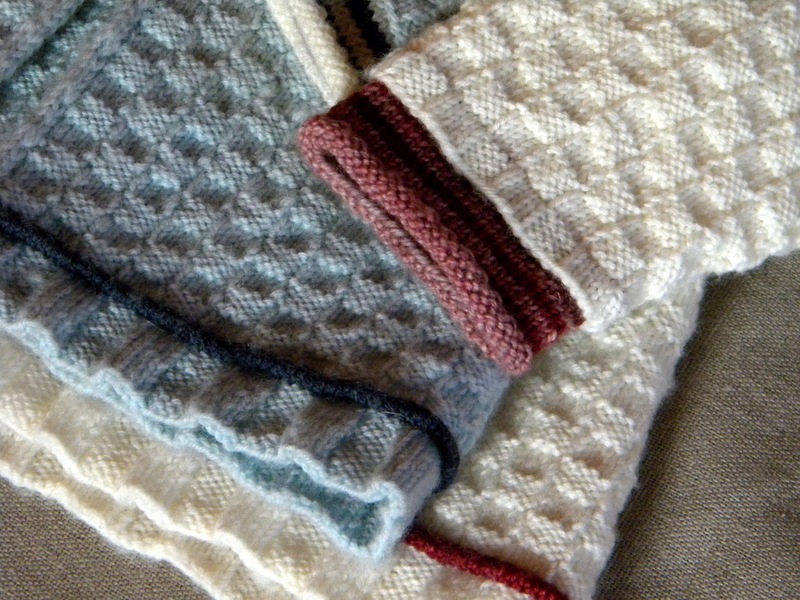 First of all, Aada is worked with small gauge, which provides a firm but light fabric, that will keep its shape in multiple washings. 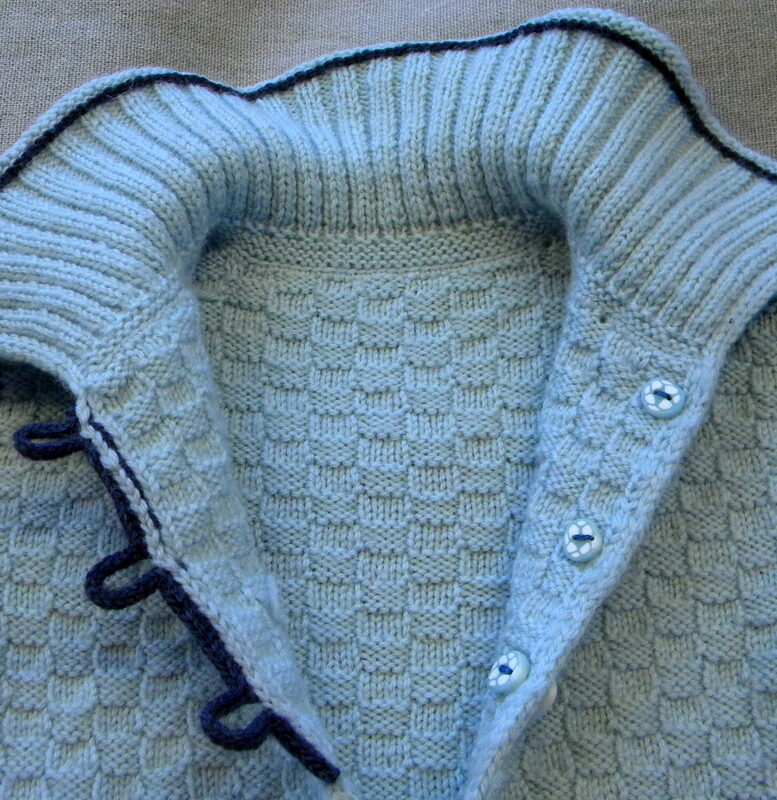 It is worked flat in one piece up to the armholes, but before one reaches the armholes, a lot has happened. 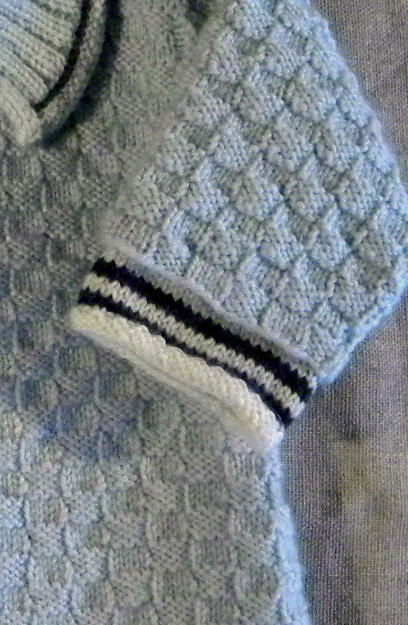 There is flaring hem that is accomplished with ribbing and decreases. Before the basket weave pattern begins, a contrast color piping marks the end of the hem and the start of the pattern. There are decreases along the sides to add slight A-line shaping. This gives extra room and adds a nice design element. The sleeves are worked in the round, again easy finishing, but I love stripes and I just had to add stripes to the cuffs. The collar took a lot of thought. It is soft and drapes beautifully. I added a row of single crochet stitches to add stability to the neck opening and few short rows to provide better fit and finished it with a row of chain stitches. Since the fronts have I-cord edgings, I was lost at first when I tried to find a solution for the closing. Then finally I found a unique way to add buttons: I-cord loops. Of course there are the backing buttons for neat finishing. I think these are all the design details. Should you like to knit Aada, you can find her in my Ravelry Pattern Store. Oh thank you for this Lene! I have been patiently waiting for this pattern since you first gave us a glimpse of this sweet sweater last year. 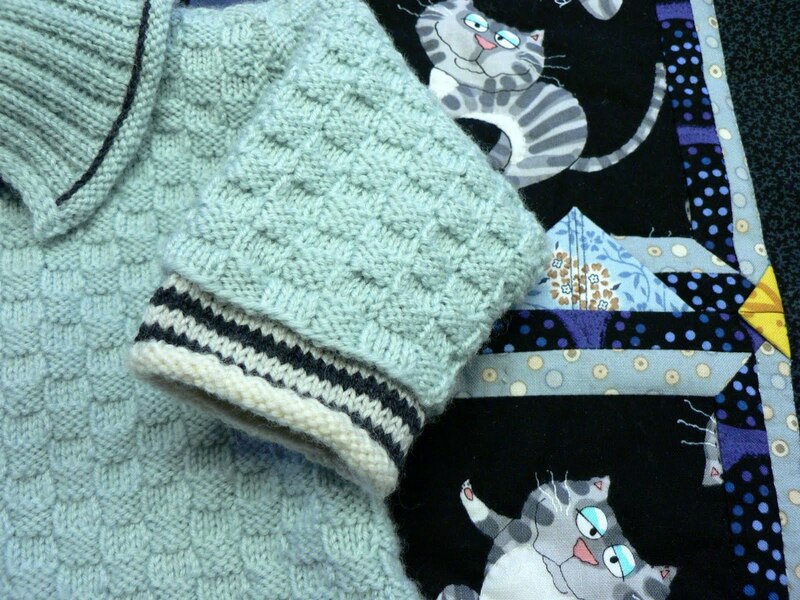 With a couple of new babies expected and a couple of babies already here I am certain that I will be making a few of these lovely sweaters in the next few months! Beautiful Lene! I love the finishing touch! Lovely sweater! There's a baby boom amongst my friends so I bought the pattern. I like that there are a lot of details that I can try out (like piping, i-cord buttonholes, that shaped collar) but because it's a baby sweater, it doesn't seem as overwhelming as if it were an adult size. Can you put a link to your Ravelry store within your post? That way, anyone who reads your blog updates via a feed (like Google Reader) can find the pattern easily. The feeds only show the posts, not the information on the sidebars. The little sweater is work of art. So sweet. With your work especially it seems to me that the art lies in the many small details you think over, work and re-work until they are just right. I thought when I looked at your photos of this sweater that it could have been machine-made--it has far too much character for that of course, but I mean in its wonderful shaping and finishing touches. Love it. it is so pretty. 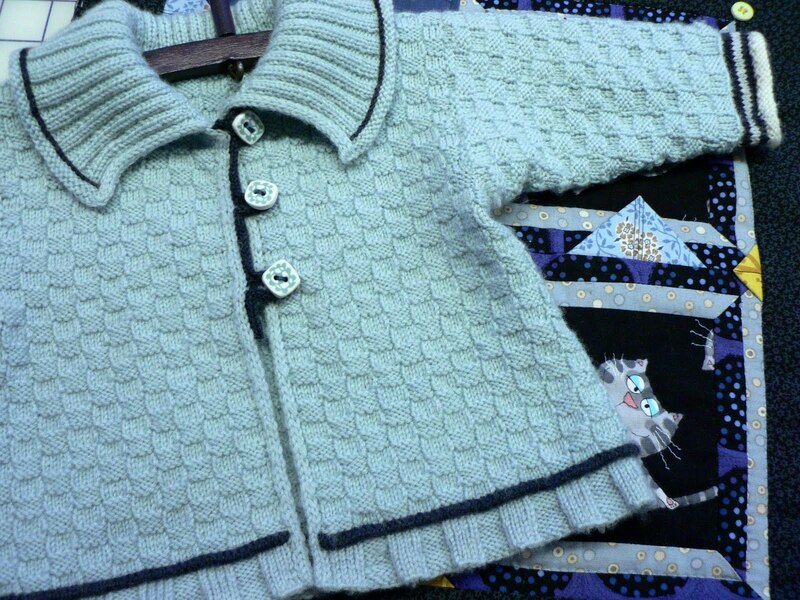 I fell in love with the little cardi when you gave us a sight of it last year - and then your life became so difficult. The selfish side of me wanted to say "Get on with it, I want it!" but my good side managed to keep me quiet and patient. Thank you so much. Can't stop - heading for Ravelry. Lene, I just love your beautiful, creative, singular children's patterns. I've bought several and I don't even know a small child. I love this pattern. I knit your Lilleput a few years ago and loved it. I'd really like to make one of these as well. It's perfect. I'm so looking forward to casting on for this! Thank you! This is so lovely. All the little details make it lovelier still!